Situated in the state of Uttarakhand, this national park is best known for the tigers and exotic flora and fauna. If exploring wildlife interests you the most and spending time with nature is what you love to do, then planning a tour the famous Corbett (also known as Jim Corbett National Park) will surely be a good idea. Located at a distance of 12 km from Ramnagar Railway Station, this 3 star hotel is situated close to Corbett National Park. Away from the hustles & bustles of city life, the hotel provides modern conveniences to the visitors in a pleasant atmosphere. It has 53 elegantly designed guest rooms with several in-room facilities. Its plush estaurant serves variety of foods. Any monument / safari fees etc. 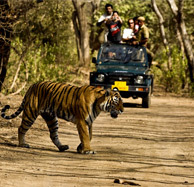 Meet our representative on arrival at Corbett (officially the Jim Corbett National Park) and check-in to the hotel. Spend the rest of the day at leisure. Enjoy dinner and overnight stay at the hotel. Rise early in the morning and leave to explore the forest and Riverside, the flora and fauna of the area. Enjoy breakfast at the hotel and proceed for the sightseeing tour including visits to Corbett falls and Jim Corbett House at Choti Haldwani. Drive back to the hotel for lunch and leave for Game drive* (4 x 4 WD Jeeps) in the National Park in the afternoon Jeep Safari. Return to the hotel to enjoy evening Tea, Campfire followed by dinner and overnight stay. Enjoy sumptuous breakfast at the hotel and check-out to depart for next destination / back home.